Trust is the Foundation of Teams. 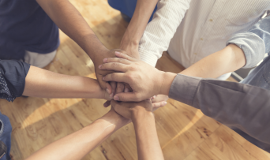 Learn how to trust one another to become a productive and cohesive team! Trust is the foundation of a productive team. No other type of trust is as important as vulnerability based trust to create cohesion within a team. Participants will also take part in different trust building activities designed to give participants a chance to get to know one another a little better and to provide them a low-risk opportunity to practice vulnerability in a safe environment. Team Building activities will also address the behaviours seen in low trust teams and behaviours seen in high trust teams. Learn how to trust one another to become a productive and cohesive team! The Team Building Agency offers workshops based on your needs and that are tailored for your team! Do not hesitate to share with us what you would like to accomplish as a team.